When working it's important to have the work gloves to match the environment, and for high-risk environments there isn't a better choice than the Portwest Cut-Resistant Nitrile 3/4 Coated Gloves A621. A tough 3/4 nitrile coating ensures exceptional levels of grip even in oily environments, while their excellent all round mechanical protection means that the gloves promise to keep the user safe in harsh working conditions. 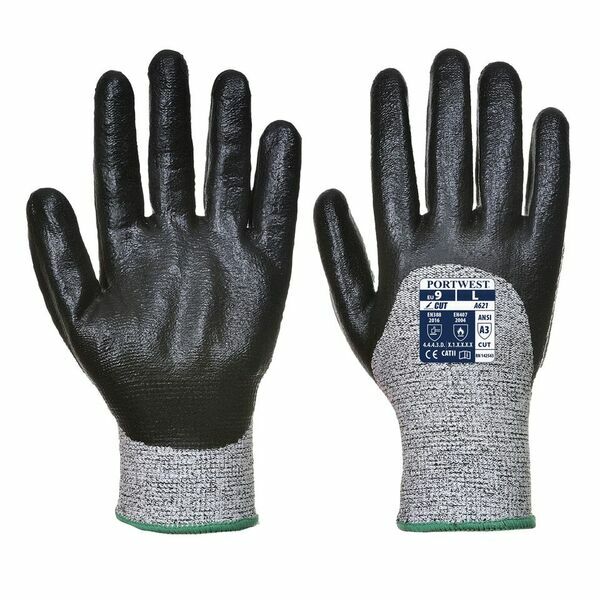 The Portwest Cut-Resistant Gloves are available in five sizes that should suit the hands of most users. Please measure the circumference of your hand around the knuckles (excluding the thumb) with your hand open and your fingers together, and the length of your hand from the tip of your middle finger to your wrist.